Humans have always looked at birds awed at the grace and ease with which the soar through the air. We strived to achieve the power of flight for thousands of years and only mastered the ability in the last century with the help of propellor and jet turbine powered flight. But what has puzzled scientists is how birds evolved the ability to fly. Recent fossil discoveries of a four winged creature called the Microraptor and experiments with model Microraptors have shed light on how birds developed the ability to fly. The Microraptor was originally discovered by a fossil hunter, civilians that work to find fossils, often without proper paleontology training. 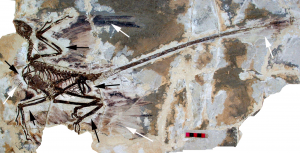 The fossil hunter claimed that the fossil was an early bird, but a museum expert proved that the original fossil was actually a composite fossil of two creatures, Microraptor and another reptilian dinosaur. 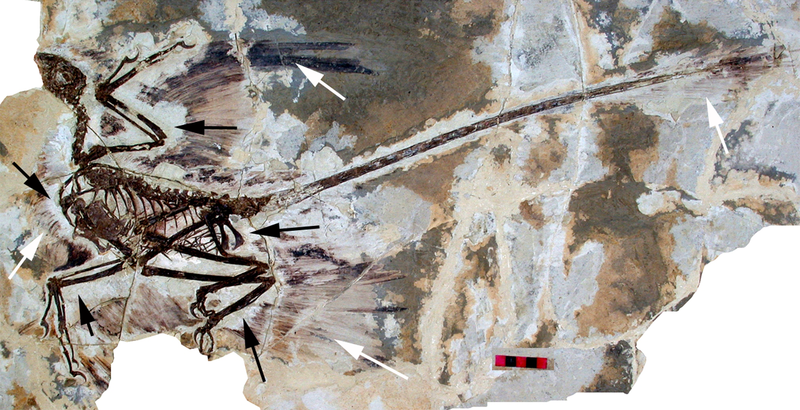 Since the first archaeological evidence of microraptor was discovered, nearly 300 additional fossils of the creature have been found. Many experts agree that these fossils link dinosaurs to birds, and that they lend credence to the top-down theory of the evolution of flight. Microraptor is often referred to as the four winged dinosaur, because it used its limbs to glide through the air, much like a flying squirrel. On each arm and leg, the Microraptor had long feathers and flaps of skin that resemble the wings of modern birds. The dinosaur was extremely small at two pounds and with a wingspan of a one meter. Its small weight allowed it to glide through the air using its long tail for stabilization. Originally, scientists thought that the Microraptor flew with its front and back “wings” on the same horizontal plane, but recent research and reconstruction of the the fossil model has helped show how the creature actually flew. In flight, the Microraptor took a nearly upright position, with its front limbs held higher up than the back limbs. Researchers at the University of Kansas and Northeastern University have built a flying model of the Microraptor that mimics how the dinosaur flew. The Microraptor’s unique flying method has led many scientists to agree that the top-down method of the evolution of flight is the correct theory, as the Microraptor spent much time in trees and behaved like modern birds do today. This link between birds and dinosaurs is just what researchers have been looking for, and may finally be substantial evidence to prove the tree-down theory of the evolution of flight. Note that the microraptor collaboration you mention is between Kansas University and Northeastern University in China, not Boston! The PBS documentary “The Four-Winged Dinosaur” can be watched in full on You Tube (enduring a couple of ads; it’s worth it, though).